‘Glyn Macey is a fabulous teacher and communicator – by far the best one I have been with and he is pleasant, friendly and helpful at all times’ Jane Langley, Collioure 2012. Glyn brings a new vibrancy to the British art scene. Using acrylic, mixed media and an array of mark making techniques he endeavours to capture the underlying essence of the landscape, the essence that shapes the landscape and the people who live in it and he encourages all abilities to try something new with their work and to have lots of fun doing it. 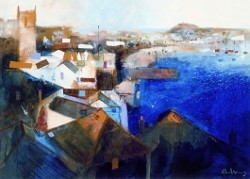 His talent and popularity is taking him in to partnerships with and commissions for the National Trust and RNLI. A Brush with the Landscapes (DVD) follows Glyn painting at 100 of the most beautiful NT landscapes in the country. Each day will start with a demonstration and teaching session explaining the day’s topic. Students will then be encouraged to produce their own work during the day at various locations in Venice, using the techniques discussed. Glyn has structured the days so that they work in order and each lesson follows on from the last to give a full, rounded course. Over the course of the week students will learn the fundamental basics of composition, tone, colour and movement and how to bring them all together for finished works, as well as how to add elements to create spark and energy. Glyn will be on hand at all times to assist and advise where necessary, and there will be Q&A sessions for individual requirements. As you glide across the lagoon and into the Grand Canal, you will be in awe of the grandeur and enthralled by the uniqueness of Venice. It is built on 117 islands and has 150 canals and 400 bridges and the reflective qualities of the water and the fabulous architecture bathed in glorious light never fail to inspire artists. Venice is a painter’s paradise whether you choose to capture the grandeur of St Mark’s, the Doges Palace, and the Rialto Bridge or work in the quieter and more authentic areas around your hotel on Dorsoduro. Everything is taken care of for you by an accompanying programme co-ordinator from the UK, enabling Glyn to focus on the teaching and your work. A comfortable and perfectly located hotel means you can paint on the doorstep from dawn to dusk with all the major sites within walking distance or a short vaporetto ride away. Flights are on British Airways and all meals are included except lunches. This improvers workshop is suitable for beginner and intermediate students.